Pine Pollen The Most Powerful Nutritive Superfood! Pine Pollen Testosterone Study: Nature's Natural Steroid? China Energy Conservation and Environment Protection Group is the only large scale State-Owned-Enterprise that is committed to emission reduction and environment protection in China. The group engages in promoting skill progress and industrial upgrade of energy conservation and environment protection, focuses on city energy conservation and environment protection infrastructure, energy conservation and emission reduction in industrial field, and cleaning skills and new resources business. It is the largest, the most characteristic and the most competitive industry investment group and an integrated service provider as well. China New Era Group Corporation was founded in 1980 and it was a government military enterprise. China Energy Conservation and Environment Protection Group was constructed jointly by China New Era Group Corporation and China Energy Conservation Investment Company in May, 2010. New Era Health Industry (Group) Co., Ltd. (hereafter referred to as New Era), established in March 1995, was a subsidiary of CNEGC; as the backbone of the group, New Era is a high-tech enterprise headquartered in Beijing and registered in the State Administration for Industry and Commerce. With a registered capital of RMB 100 million, it is the only enterprise in the industry under the State-owned Assets Supervision and Administration Commission of the State Council. The company received a "Direct Selling Permit” issued by the Chinese Ministry of Commerce on August 16, 2006. It is one of the first enterprises who obtained a Direct Selling Permit in China's direct selling industry. New Era has always been insisting on the corporate culture of “Developing national industry and benefiting human health”, carrying forward the health-preservation culture of the Chinese people and the philosophy of “homology between food and medicine”. Constantly exploring and utilizing the essence of Traditional Chinese Medicine, and making full use of local natural resources and advanced technologies, New Era has successfully developed “Guozhen” series health food, high-quality Shareland skincare products, Zhuzhen personal care products and daily chemicals, providing people with a healthier life. After over ten years’ development, New Era has grown into a group corporation that integrates raw material acquisition, research, manufacturing, sales and service with 4 subsidiaries and 31 sales branches. 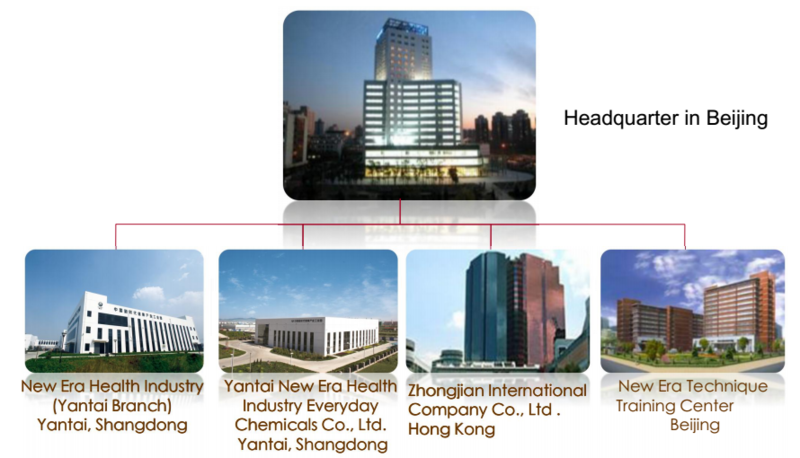 China New Era Health Industry Park in Yantai is the production base of New Era Health Industry (Group) Co., Ltd. (New Era), located in Yantai, Jiaodong Peninsular. Close to mountains and facing the sea, the park is clean and orderly, enjoying fresh air. Integrating R&D, production, office, and logistics, New Era consists of production base of health products and daily chemical. Since its establishment, New Era has acquired the GMP certification for health products, the ISO9001 certification, ISO14001 certification, the HACCP certification, the OHSAS 18001, as well as the access to the list of Export Food Manufacturing Enterprises, forming an all-round, comprehensive management system to ensure product quality. New Industry Park of New Era laid a foundation on 9th March, 2012. The total investment is 0.35 billion USD and the construction area is 352.3 thousand meter squares. The industrial park is designed by the principle of modernization, GMP standard, garden style park and will construct manufacturing area, R& D center, quality control center, logistic center, etc. It will possess the world-leading production capacity of health food and nutritious food such as pine pollen, bamboo leaf extract, flaxseed oil and so on.